PHOENIX - Feb. 14, 2019 - PRLog -- The Feathered Quill Book Awards has presented author Carly Kade with the Bronze Medal for her equestrian romance novel, Cowboy Away. Fresh off of the book's EQUUS Film Festival Literary Award win for Best Equine Romance, Carly adds the Feathered Quill nod in the 'Book featuring Animals - Adult ' category to her growing roster of literary honors. In 2017, In the Reins, the first book in her series for horse lovers, won two Feathered Quill Book Awards in the 'Romance' and 'Book featuring Animals - Adult ' categories. Feathered Quill is one of the preeminent book review sites on the Internet. The submissions for the Feathered Quill Book Awards come from all types of publishers from independent authors to the major New York publishing houses. 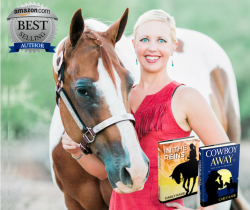 "I am honored to be the recipient of the Feathered Quill Book Awards Bronze Medal for Cowboy Away," said Carly Kade, author of the In the Reins series. "I wanted to write an equestrian romance novel with an honest depiction of the human-horse bond. Winning a Feathered Quill Award in the 'Book featuring Animals - Adult' category really validates that I've accomplished just that with the sequel to In the Reins." A satisfying sequel to the author's first book. Character development was well done. A good continuation to In the Reins. McKennon Kelly is an interesting character the author has developed well. I look forward to reading more about him in a future book. Action and suspense to keep the reader going. A deeply romantic and suspenseful sequel, Cowboy Away follows horse trainer McKennon Kelly as he hits the road with nothing but his memories, a pistol and hope to put his demon to rest. He's a cowboy caught between his present and his past who learns that sometimes one has to go backwards in order to go forward. In this follow-up to In the Reins, readers start exactly where the first book left off, take a deep dive into the history of the Green Briar gang, meet some new characters, and follow the enigmatic Quarter Horse trainer into his tumultuous past. The In the Reins horse book series is for readers who enjoy equestrian fiction with a message and a flurry of romance. Carly's novels are available now in audiobook, paperback and eBook on Amazon, Audible, Barnes & Noble, iBooks, Google Books and Kobo. Visit Carly's blog (http://www.carlykadecreative.com/blog) where she shares new videos, photos and stories that highlight interesting cowgirl topics, equine author interviews, horse tips, series sneak peeks, event updates, and release info! Join the herd and connect with Carly Kade Creative on Facebook, Instagram, Twitter, Pinterest and YouTube.